On the surface the Northern Ireland assembly elections have resulted in a return of the status quo with the larger parties winning broadly the same number of seats. However there has been a generational change in many of the personnel involved, and in some ways the election marks a further milestone on the road towards the normalisation of Northern Ireland politics post the Good Friday Agreement. As in the Republic of Ireland, the "others" category made up of Independents and smaller parties are the winners with the left wing People Before Profit party winning two seats and becoming the second party, after Sinn Fein, with representation on both sides of the border. For the first time, therefore, Sinn Fein is facing a significant challenge from it's left, both north and south of the Border. Arlene Foster has consolidated her position as leader of the DUP (the Paisleyite Democratic Unionist Party) and First Minister which could also have repercussions for the Brexit debate as her party are campaigning for a Brexit from the EU. With the UUP (old establishment Ulster Unionist Party) campaigning with the Remain side, it looks as if the Brexit debate will not be conducted on purely sectarian lines with the UUP campaigning on the same side as Sinn Fein and the SDLP (Social Democrat and Labour) and Alliance (moderate, centrist, non-sectarian) parties. 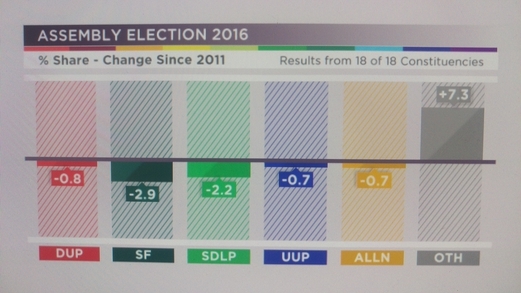 The final results, just in, are: DUP, 38 seats (no change); Sinn Féin, 28 (down one); the Ulster Unionist Party, 16 (no change); the SDLP 12 (down two); Alliance, eight (no change); the Greens, two (up one); People Before Profit, two (up two); Traditional Unionist Voice, one (no change), and Independent unionist Claire Sugden (no change). The distribution of seats within constituencies highlights the degree to which voting in N.Ireland is still very much on a territorial, tribal basis. Together the two unionist Parties, DUP and UUP have 54 seats, exactly half of the 108 seat assembly, whilst the two nationalist parties (Sinn Fein and SDLP) have 40 seats. The only minor bright spot being the three seat gain by the non-sectarian Alliance, Green, and People before Profit parties. Turnout was a semi-respectable 55%, but down on the nationalist side in particular. Disillusion with Sinn Fein for signing up to the Fresh Start Agreement, consisting of to British government welfare cuts, may be part of the reason. However a disillusion with sectarian politics, and with politics in general, may be the larger reason. My own view is that a Brexit vote might not be as bad for the Republic of Ireland economy as is commonly supposed, chiefly because it could result in a considerable re-direction of US FDI from the UK to Ireland. However it could be devastating and very destabilising for N. Ireland as it is very dependent on British and EU subventions for it's very public sector orientated economy. In time, this could result in a de-legitimisation of the DUP (which, very stupidly, in my view, is campaigning for Brexit) and ultimately, of the N. Ireland state as a whole. In the short term, however, it will raise all the atavistic fears the Unionist community have about a united Ireland, and possibly lead to a resumption of violent conflict. In addition, there is no way the Republic could take over the c. 11Bn subsidy the UK currently gives to N. Ireland, and so a very drastic reduction in living standards will result. Much as I might wish otherwise, I don't see a United Ireland coming out of this mess any time soon. A brief description of the parties shown in the OP, or, at least, the words for which the initials stand, would be greatly appreciated. For many of the non-Irish the politics of Northern Ireland are even more obscure than those of Ireland, with which we are more familiar thanks to yourself and Coleman. I have added brief descriptors to the Party initials to clarify their titles but have avoided a complete explanation of each as I am not sure how much interest there is in N. Ireland politics in general, and have therefore sought to keep this story as short as possible. I have also added links to the relevant wiki pages for those who are interested in a more detailed explanation of their origins and orientation. Just what was needed. I know enough of the history for what you provided to make sense now.